What is your favorite savory food? sweet food? No need to do that, I just love the name my late Mom choose and named me, and I will not be able to respond to anything different. Alice in Wonderland as her constant resource and strength is her courage. According to Google: A guilty pleasure is something, such as a film, a television program or a piece of music, that one enjoys despite feeling that it is not generally held in high regard, or is seen as unusual or weird. As I am not a big film or television person, I will have to go with the music and I just love listening to ABBA. Darlene, this is something different to answer: Me being a foodie, how must I choose between all my gadgets and utensils? Sorry, my friend, I love them all equally for the individual roles they play in cooking/baking and creating! My ❓❓❓ to you all – ready set, go!! If your five-year-old self suddenly occupies your body, what would the first thing be that your five-year-old self will do? If you were given five million dollars what will you do with it? What is the most interesting thing you have near you right now? Please add a picture. Thanks for answering my questions. I hope you get to Greece one day. The last question is from my employment counselling days and is one of those think outside the box questions that employers will often ask at a job interview. I would pick a whisk as I like to mix everything together to create a great final product. I look forward to reading the answers to your great questions. 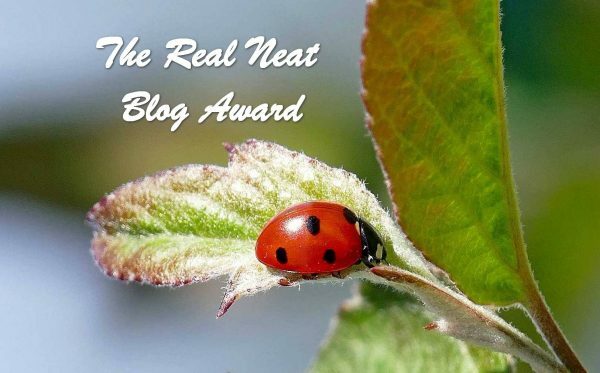 You certainly deserve the Real Neat Blog Award!! Thanks again dear Darlene, you’re very kind and generous. Take care my friend. I meant to say, I wouldn’t change my name either if it was Esme. That is one awesome name! Thanks for also sharing my post, this is amazing. Fun to learn more about you. Guilty pleasure? ABBA would be one of mine, too! Your questions for your seven bloggers are fabulous. Oh wow, wow wow, just read your most recent post and just had to tweet and share it. How about you also participate and share your posts at Senior Salon. I will be honored if you will see your way open to participate. Esme, I love your name too – inspired choice by your mother! Abba a guilty pleasure – just a pleasure surely!! Oh, poor you trying to answer question 7 – I think you did well – there is no way you could choose! I’ve scanned through your questions and they are brilliant – thought-provoking, funny and a chance to share a photo. I hope some of your nominees take up the challenge as I look forward to reading their answers. Thank you Annika for your kind words, reading and following here. Esme, thank you so much for the invitations. I followed Senior Salon when run by Bernadette although I never posted much there. I would love to take part – do I just add a post once a week? As for the interview – yes, I’d love to take part. Just let me know when would suit you best. Believe me, I haven’t forgotten about the guest post but not found a good start to one! Annika as for Senior Salon. Each Monday a new link will be published on my blog. Go to the blue froggy and tap it to be directed to enter your post link and submit. Then read some others and promote the SS and share some fellow posts. For the Interview you can just go to my main page and the interview tab and you will see where to email your answers to me. Remember to add profile pic and all social media links and I will let you know via email of the next available date for publication. Guest post, that will be awesome. Again just email when ready. Great responses, Esme. I enjoyed learning more about you. Thanks for the nomination. I would love to participate. Congrats to you on your well deserved award. Thanks, love it and commented on your blog as well. Thanks so much for linking, and the shout out!